CocktailMom: Even the Obama's are canning! The presentation of gifts to visiting foreign dignitaries is a time-honored tradition that helps transcend cultural barriers and offers a symbol of peace and friendship. In honor of the 65th anniversary of the United Nations General Assembly, First Lady Michelle Obama has assembled an assortment of gifts that reflect her past 20 months in the White House. The White House Kitchen Garden, which provides the Obama family and White House guests with delicious fresh produce, is the central theme behind this year’s gift. 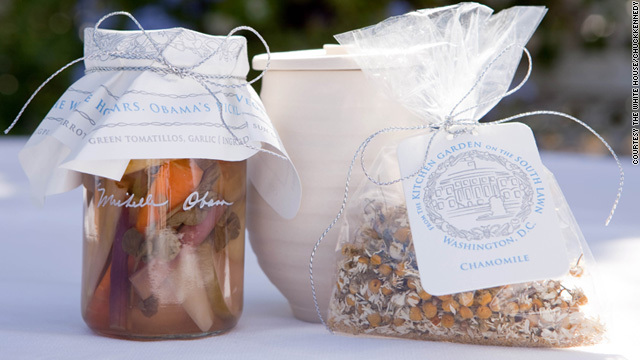 A special recipe of pickled, hand-picked ingredients from the White House Kitchen Garden, including sun gold tomatoes, okra, cucumbers, chocolate bell peppers, carrots, lemon verbena, and fresh herbs are presented in jars with the First Lady’s signature. The jars are topped with original artwork done by California artists, Michael Cronan and Karin Hibma, who were inspired by a photo of Mrs. Obama tending to the garden with children and a wheelbarrow. Chamomile seeds were harvested from the White House Kitchen Garden for the first time this year and are being shared by Mrs. Obama. Also included in the gift is an off-white clay Tea Canister hand-made by Virginia potter Catherine White, whose work is inspired by the varied landscapes of nature. I LOVE this! I love that our President and his family are setting such a wonderful example of what gifts should be, simple expressions of love and thoughtfulness.